It is a combination of biotin, minerals and amino acid and these nutritional supplements help for proper functioning and provide good health. It also help to improve cholesterol level, red blood cells and help in immunity. It is useful against detrimental problems like asthma, autism candedeases, osteoarthritis, Parkinson's disease. 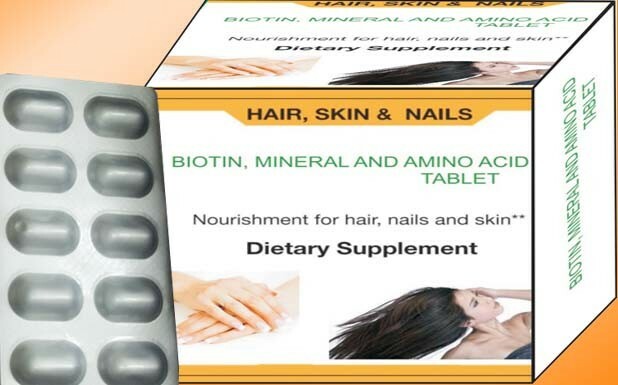 Combinations of Biotin, Mineral and Amino acid play very important role in immune system and help to make red blood cells and improve cholesterol level in body, It also usefull against detrimental problems like asthma, autism candedeases, osteoarthritis, Parkinson's disease, hair loss and healthier nails. Biotin is also called B7 and it is essential to human health and it help in conversion of carbohydrates, fats, and protein into usable energy in the body. It play important role in health and beauty of Hair, Skin and Nails and also protect hairs from dryness and breakage. Vitamins are used in the body individually and in combination with minerals which help release energy from food. They are also of extreme importance to the nervous system. B vitamins are required by the metabolic pathways that generate the energy. Every system in the body depends on these vitamins for their role in energy production. Due to its role in glucose production, biotin has an effect in the amount of sugar in the blood. Levels of biotin are said to be indirectly proportional to sugar level. Biotin supplementation is one of the recommended treatments for people who suffer from diabetes. Sufficient quantities of biotin have long been known as a key element in maintaining healthy hair and skin. In this combination we also use another vitamins like Vitamin B3 and Vitamin B5 It help to improve cholesterol levels and lower cardiovascular risks and help nervous system function properly. B5 is helps in relieving human body from a number of detrimental problems like asthma, autism candedeases, osteoarthritis, Parkinson's disease. In this tablet we use different minerals like Zinc, Iron, Mannganese, copper and Selenium. It's a essential mineral and plays a role in immune function, protein synthesis, wound healing, DNA synthesis, and cell division. Manganese is one of trace mineral and essential to your health. Manganese is also indicated in stimulating growth of the connective tissue and brain function. Copper is required in the formation of hemoglobin, red blood cells as well as bones and Selenium is a trace mineral that is essential to good health. Plant foods are the major dietary sources of selenium The content of selenium in food depends on the selenium content of the soil where plants are grown. Selenium has antioxidant properties so it protect cells from damage. Amino acids play central roles both as building blocks of proteins and as intermediates in metabolism. In this combination we use two amino-acids L-Lysine and L-Cysteine. L-lysine, is an essential amino acid. That means it is necessary for human health. lysine are the building blocks of protein. Lysine is important for proper growth, and it plays an essential role in the production of carnitine, a nutrient responsible for converting fatty acids into energy and helping to lower cholesterol and help in formation of collagen (a substance important for bones and connective tissues including skin, tendon, and cartilage). L-Cysteine is a non essential amino acid, meaning it can be synthesized by humans. Cysteine is found in many high protein foods, including chicken, pork, eggs, milk, cottage cheese, garlic, granola and onions. L-Cysteine is beneficial in numerous ways. It is important in detoxification and in the formation of skin, as well as the repair of hair and nail tissue. L-Cysteine helps defend against harmful toxins and protects the body from damage caused by radiation and helps to maintain optimal health and enhances immune system function. It has been demonstrated by recent studies concomitant administration of an Biotin, Mineral and Amino acid tablet shows significantly better improvement of cholesterol levels, detrimental problems like asthma, autism and play important role in immune function and formation of hemoglobin. It promotes healthy hair growth & protects against dryness and help in nail growth with each of the treatment. As nutrients in their proper amounts are required for optimum health and since our diets most likely cannot provide all of them, nutritional/health supplements can fill in these gaps. Nutritional /health supplements are also useful in getting rid of the toxins which one is exposed to, as well as the lifestyle-these all subject one to harmful toxins which can lead to serious health problems. so biotin, minerals and amino acid combination provide nutritional supplement for good health. From the above discussion, it can be concluded that this Biotin, Minerals and Amino acid tablet could improve the quality of life of with enhance immunity and control the level of cholesterol, making red blood cells in body and osteoarthritis, Parkinson's disease, hair loss and healthier nails. It is also useful for development of the central nervous system and also help to maintenance of muscles. We are making superior quality of Biotin, Mineral and Amino acid tablet. Our offered tablet is processed using high grade chemical compounds by our experienced quality controllers that ensure its quality, purity and chemical properties. Highly treasured among the clients for its reliability, accurate composition, excellent physical and purity, this tablet is offered to our esteemed clients at the market leading prices.